Traveling from London, the UK and Paris to Metz, capital of Lorraine. Centre Pompidou Metz-Photo Roland Halbe. 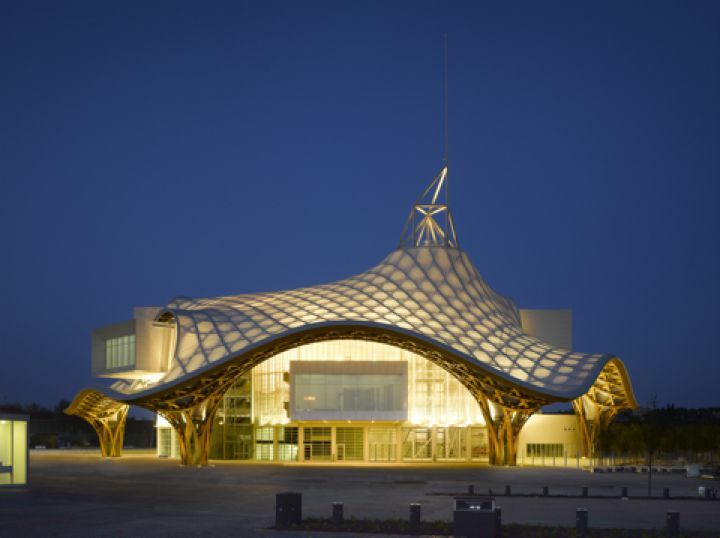 Read more about Paris and the Pompidou-Metz Center in Metz. Metz (pronounced ‘Mess’) is the capital of Lorraine in the Grand Est region of France. It’s always been an important town, on major trade routes from Roman times. It’s on the River Moselle near the Autoroute de l’Est which connects Paris to Strasbourg, plus the main Strasbourg to Brussels train route. On the Moselle and Seille Rivers, Metz is known for its gothic cathedral and its huge amounts of satined glass windows which fill the stone building with glorious colours. Today, it's equally famous for the Pompidou-Metz Center, a very successful offshoot of the Pompidou Center in Paris. With such an easy train journey from Paris, many people just come to visit the center for the day. It holds important temporary exhibitions which change regularly, some using material from the main Pompidou Center in Paris; others are from different collections around the world. TGV trains to Metz leave from Gare de l’Est in Paris (Place du 11 Novembre, Paris 10th arrondissement) all through the day. The journey takes from 1hr 24mins. There is a direct TGV train from Nice to Metz which takes 9 hrs 17 mins. However, if you change in Paris, from Paris Gare de Lyon (from Nice) to Paris Gare de l’Est, the journey takes less time, from 8 hours 30 mins. The TGV train from Metz to Montpellier takes 6 hrs 58 mins. If you change in Paris, from Paris Gare de Lyon (from Montpellier) to Paris Gare de l’Est, the journey takes from 5hrs 38 mins. Metz station is on place General de Gaulle at the end of the rue Gambetta opposite the main post office. It is a short walk into the center of town. Popular destinations include Nancy (from 31 mins); Strasbourg (from 1 hr 17 mins); and Luxembourg (from 49 mins). See the major TER services on the TER website. Metz-Nancy-Lorraine Airport is in Goin, 16.5 kms (10 miles) from Metz via a shuttle bus which takes 30 mins and costs 8 euros. The airport flies to most major French cities and to other European destinations such as Amsterdam, Barcelona, Dusseldorf, Venice, Rome, Prague and London. For flights to New York, you will have to change in Nice. The distance from Paris to Strasbourg is around 332 kms (206 miles), and the journey takes around 3 hrs 15 mins depending on your speed. There are tolls on the Autoroutes. For information on hiring a car under the lease-back scheme which is the most economical way of hiring a car if you’re in France for more than 17 days, try Renault Eurodrive Buy Back Lease. By bus/coach Eurolines offers a cheap service from London, Gillingham, Canterbury, Folkestone and Dover to Paris Charles de Gaulle Airport and Paris Gallieni. Six coaches a day; 2 overnight; journey time is 7 hours. The Eurolines stop is at the Paris Gallieni Coach Station, 28 ave du General de Gaulle, just by the Gallieni metro station near the Porte de Bagnolet (Metro line 3, final stop). OUIBus also operates between London and Lille and London and Paris. IDBus also goes from Lille to Amsterdam and Brussels. Read guest reviews, compare prices and book a hotel in Metz with TripAdvisor.